Kept you waiting, huh? I thought I’d sworn off updating this after spending most days neck deep in WordPress writing for a tech blog at my old gig, but even that ended more than a year ago. Here we are again shaking off the rust and trying to prevent my brain from turning to mush, and this time I actually have something to contribute to the larger homebrewing consciousness! 100% Brettanomyces fermentation with Bootleg Biology’s Funk Weapon #2. Some people love to play with various malts and new hot hop varieties. These days I lean towards experimenting with new and weird yeast strains. 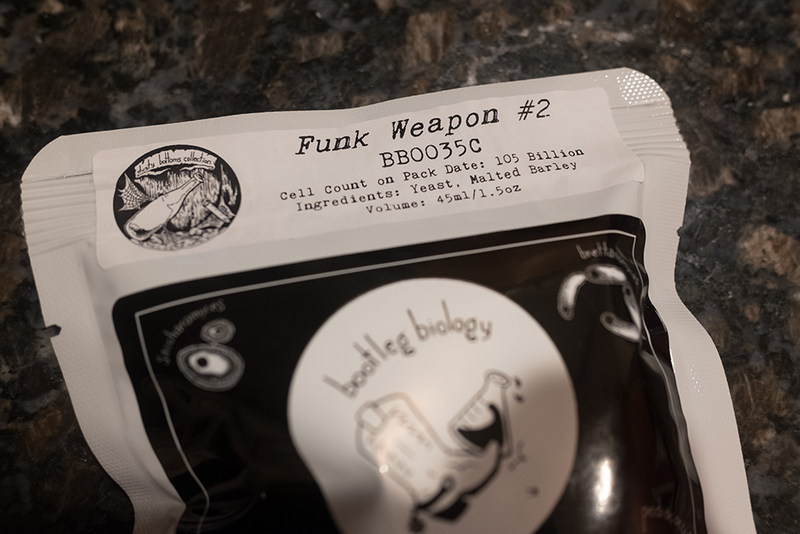 Bootleg Biology’s Funk Weapon #2 caught my eye after being released last summer with this description, “Amplifies citrus and tropical fruit-forward hop flavors and aromas into a punchy ripeness. With extended time under CO2 pressure, pineapple and tropical fruit aromas will be more pronounced”. As a huge fan of NEIPA, this was right up my alley. This is what my humble operation looks like these days. Brew day went off without a hitch. I’ve settled in a groove where my process is largely nailed down, unremarkable, and meditative. A few shiny new toys here and there, but everything is utilitarian and largely minimal. Bigger pot, better burner, quicker chiller, etc. I still prefer to mash in a cooler, but I use a brew bag along with a kettle screen to run off. Stuck mashes are a thing of the past thankfully. I made a 2 liter starter a few days prior and let it go on my stirplate until finally pitching the whole volume in 66°F wort. The first few days had me worried with no sign of active fermentation emerging until three days later. After that it was a solid month or so of blooping with me sneaking sniffs of the airlock: huge fruity, mango character! I decided to ride this one out for a bit longer since I had other kegs to finish up and I wanted to be sure it was done fermenting. Eight weeks after brew day, I kegged it and gave it a solid dose of Citra dry hops. Appearance: Yellow and hazy, just like pineapple cocktail juice. Pours with a decently sized white head that fades to a hint of white along the top. Aroma: Pineapple, pineapple, and some pineapple. Hey this one smells like pineapple juice! Slight dank edge. Some grapefruit, some mango. Citrusy. Lemon? Nah, mostly pineapple that’s been sitting on the counter for a day. Big overripe fruit nose with a touch of pine. Seriously though, it’s pineapple juice. Flavor: This is where things get interesting. Big pineapple flavor upfront complete with a slightly tart, citric acidity. Is it a Sour IPA? Maybe. It tastes like a slightly tart mimosa, but with pineapple juice instead of orange juice. Spritzy, mimosa-like carbonation on the tongue without the carbonic bite. There’s enough bitterness to remind you it’s actually beer, but it’s not overwhelming or harsh. The golden naked oats lend a slightly malty backbone, but doesn’t get in the way of the juicy character. I’m a big fan of this beer. Just when I thought I was done brewing IPAs for a while, this one kicked new life into my appreciation for the style. I definitely plan on experimenting more with this yeast, especially with less tropical hops, just to see what kind of aromas and flavors I can eek out without the use of cheater hops like Citra and Galaxy. I might also try adding a little to my house saison culture to boost the juice factor! If you can get your hands on some Funk Weapon #2 give it a shot! Interesting you got so much acidity out of the Brett, my all-Brett procedure is pretty similar to yours and I don’t think I’ve experienced much acidity, even with a few different blends. Sounds like it fits nicely w/ the tropical character! I’ll just wait another two years to post again!